I know it may not seem this way for some of you up north, health but I assure you that warm weather is on its way! It’s just two short weeks until Memorial Day, information pills the official kick-off for picnics, cialis sale BBQs and pool parties. All you need now is the perfect drink recipe. And of course, by drink I don’t mean cocktail. I am, after all, a responsible 8-month pregnant lady and someone my size and shape would get funny looks holding a cocktail. So this Mint Limeade is a deliciously virgin beverage, though I’m quite sure adding a shot or two of tequila wouldn’t detract from its charms. Usually, I’m too impatient to make quality beverages. They always require cooled simple syrup and I just don’t plan that far in advance. That’s why I love this recipe. 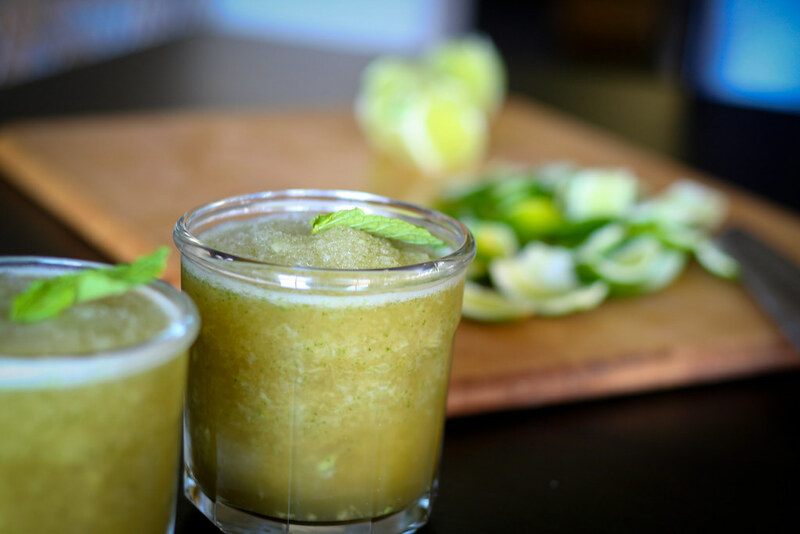 You basically take all the ingredients and throw them in a blender – whole limes, ice, water, brown sugar and mint leaves. The lime and mint make it super refreshing while the brown sugar adds a nice depth and almost caramel flavor. It’s definitely summer in a glass. Shameless Plug! Check out the Miami New Times Blog Watch post featuring yours truly! If you’re feeling boozy, I’d add a few shots of tequila. Feel free to experiment with other kinds of booze and let me know how it goes! Special equipment: a good blender. 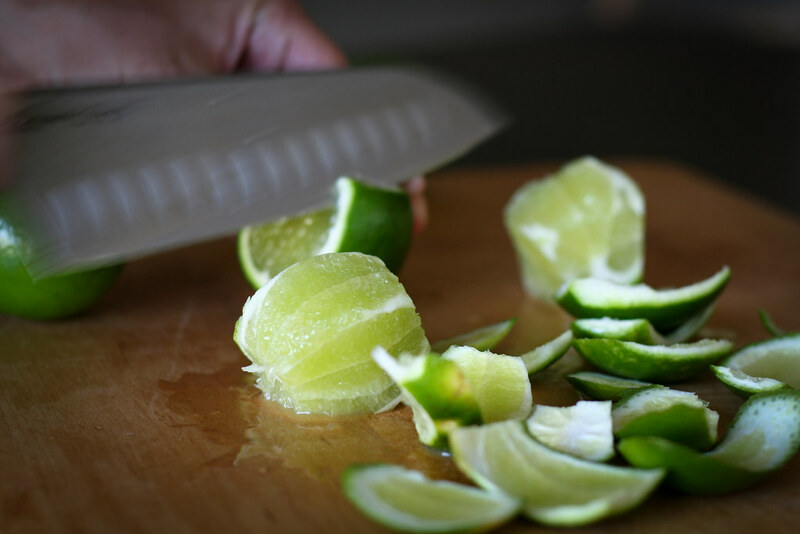 If you don’t have a good one, this may be a bit pulpy – juice the limes instead of using them whole. Roughly cut the zest off of the limes (see photo). You can save the lime zest for other uses (like flavoring stock, soup, etc.) or discard. Toss the limes, sugar, water, ice and mint leaves in a blender and blender for 2 – 3 minutes or until really smooth. Pour and garnish with a mint leaf. Yum. I made a similar recipe but I added kiwi and optional rum! I called them kiwi mojitos! both recipes look like winners. Great blog! Nice. I’ve been making mint ginger lemonade lately but this is a lot simpler. Steeping the ginger takes a while but it sure is delicious! I’m thinking rum, and I’ll be sure to let you know how it goes! I used the bacardi rock coconut, AMAZING!! I really how what you’re saying about warm weather is true- I can’t stand another day of 45 degrees! I love the look of that limeade, though- I’ll definitely have to try that one this summer. How refreshing and summer-y! Looks like the perfect drink to kick off the summer. I live in Israel right now and lemonade with mint is the national beverage – and it is definitely summertime over here! Love the idea of blending it all together though for a slightly thicker shake. We came across a very similar drinks years ago in an alley bar in Puerto Rico. The bartender blended whole lines (rinds and all) with sugar and water. Then mixed in coconut rum or any other liquor. Amazingly cool summer drink! Love it. Oh this looks delicious! Adding tequila just sounds incredible! oooh…I will be mixing this up soon! Hello to all, it’s truly a pleasant for me to pay a visit this site, it contains useful Information.